The Google Plus vs. Facebook war is on. Although still on trial run and can only be accessed by a limited number of users, Google's latest foray in the world of social networking has been doing great so far, receiving generally positive reviews from those who have already used it. A lot of tech blogs and news sites are praising Google+ and are calling it a potential Facebook killer. I think all those compliments are worthy. I've been using Google+ for several days already and I can honestly say that it is simply awesome. It is clean, fast and intuitive, and it puts privacy on top priority. I think Facebook is too cluttered and noisy nowadays that a lot of people will find a new home in Google+. 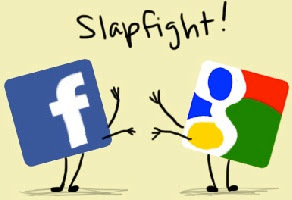 This early, Google+ has already gained several fanboys who think that it is ready to give Facebook a big slap in the face. In fact, some fans have been creating and sharing several funny Google+ vs. Facebook animated GIF images. I hope you all had a good laugh. If you know of other hilarious Google+ vs. Facebook animated GIF images, feel free to share them with us. For those of you who would like to try or use Google+, I can send a few more invites. So, please leave your email address via comment or you may contact me directly. Unfortunately, Google+ does *not* put privacy first. And that, sadly, is a deal-killer for a lot of people.